Small/ medium enterprises (SMEs) represent a sizeable proportion of the GDP of most western economies. Not only are they the single largest employer of both skilled and unskilled labour but they make up a large proportion of the supply chain of larger enterprises. 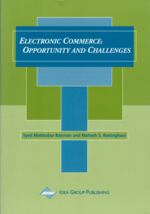 Although there is a strong advocacy for the potential of EDI to improve the performance of those firms involved in the industrial supply chain, Lee, Clark and Tar (1999) suggest that much of the improvement—which includes areas such as: improving the bottom line; working faster and better in the organisation; gaining strategic advantage; strengthening customer relations; preparing for the future in business—benefits the EDI champion rather than those coerced into EDI use. Studies (Kilbane, 1998; Tucker, 1997) have shown that noncompliance to EDI by SMEs can result in larger enterprises being ‘limited’ in their own business practices often far more than the small business’s economic contribution. A number of reasons have been put forward in the literature as to why SMEs have been slow, or indeed resistant to adopt EDI. These include high set-up costs, poor security and limited EDI partners. While clearly these are important, Harvey (1992) and Mackay (1992) suggest that when attitudes to EDI are being considered, this must be taken in the context of attitudes to IT in general. Based on the views of both Harvey (1992) and Mackay (1992), this chapter examines two studies carried out in Australia. The first study examined the attitudes of SME managers towards the acquisition of IT in their organisations. 131 small businesses were surveyed, the results suggesting small business managers considered the benefits expressed by EDI advocates (improving the bottom line; working faster and better in the organisation; gaining strategic advantage; strengthening customer relations; preparing for the future in business) as being of little consequence. Rather, their primary considerations for the adoption of IT were cost/benefit, ease of use and performance. A second study concentrated on 16 of the respondents from the first study who had adopted EDI in order to conduct business with Australia’s largest steel- making company, Broken Hill Proprietary (BHP). While the second study is, at best, a pilot, both suggest that designers and advocates alike need to examine the small business environment more closely. They need to realise that the operation of SMEs differs markedly from their larger counterparts and that small businesses’ managers are more interested in maintaining the operational level of the firm rather than attempting to gain a strategic advantage.